Power wash your deck, prep for painting, remove tough concrete stains and more with this powerful pressure washer from Generac. Long been known for their quality engines, this model is no exception, equipped with a powerful 420cc Generac OHV engine. Also included are five Quick-Click nozzle tips (0-degree Blast, 15-degree Strip, 25-degree Clean, 40-degree Wash, Soap) and a 50 foot hose. 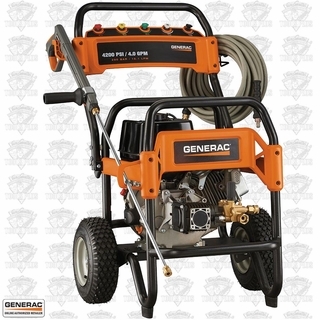 Generac's power washers are carefully engineered for longevity and ease of use, with well thought-out features not found on competitive models. Easy to maneuver, the welded frame is designed for durability, with a built-in step for easy starting and an integrated gun holster. The easily accessible high-performance axial cam pump provides maximum heat dissipation for extended life and the easy to pull trigger reduces fatigue. The pump is located well above the ground, eliminating the need to kneel down to make hose connections. Backed with a 3 year limited warranty. Founded in 1959, Generac has earned a reputation as the company home and business owners turn to when the power goes out. The first to engineer affordable home standby generators, along with the first engine developed specifically for the rigors of generator use, Generac now sells more home standby generators than all of our competitors combined. We have brought this same level of commitment and quality to our pressure washer products. Our customer research has led us to engineer our pressure washers from the ground up, to meet your specific demands. Generac manufactures the widest range of power products in the marketplace including portable, RV, residential, commercial and industrial generators. Generac also operates three large factories which employs thousands of workers in the American Midwest. Note: This model is not for sale in California/non-CARB compliant.